Many woodworking projects require precise holes of varying sizes to be drilled into the boards. While a power drill or even a cordless drill can be used for making these holes, there is a much more precise tool for drilling. The drill press has a much larger motor and a larger chuck than a standard power drill, allowing for drilling with much larger drill bits than can be used in a hand drill. Additionally, when trying to drill a hole square to the face of a board with a hand-operated drill, you'd be merely eyeballing to see that the drill is straight up and down. However, with a drill press, there's no guessing as long as the drill press table is square to the spindle of the drill press. 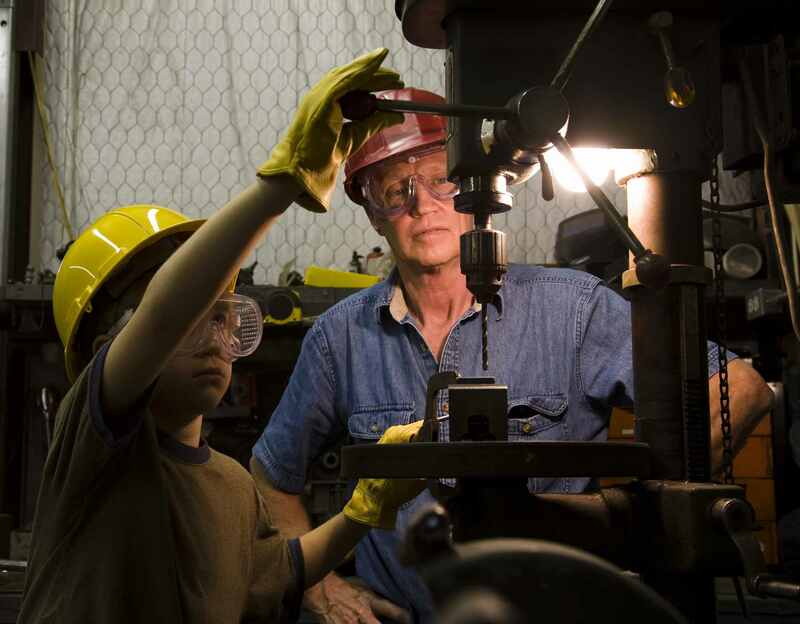 Here are some articles on learning how to get the most out of your drill press. Drill presses are typically either floor-standing models with a table that can be raised or lowered to adjust for thick stock or long bits. However, some smaller table top drill presses are available if you don't need a big floor-standing drill press. In most cases, the drill spindle is turned by a belt on a pulley from the motor, and by changing the pulleys on the spindle and the motor, you can alter the drilling speed of the bit before plunging it into the wood stock. In this article, learn all about how to set up and use your drill press for drilling in all kinds of wood. Because of the precision of the drill press, it can be used for a lot more accurate drilling operations than a hand-operated power or cordless drill. For instance, using a drill press, you can drill holes in corresponding pieces of wood for doweling, which is a method of using dowels to join two boards together. You can even use the drill press for sanding curved cuts. Want to learn more? Read this article to learn about these functions on a drill press. Like any power tool, the drill press can benefit from some general maintenance on a regular basis. One of the maintenance tasks that will help to keep your drill press operating correctly is to check or adjust the alignment of the spindle and the saw table. In this article, learn how to align your drill press and keep it drilling accurately no matter what angle of hole you need to drill. In addition to aligning your drill press, it's a good idea to give your drill press a tune-up on occasion. This involves inspecting parts of the drill press (and making repairs if needed), checking the pulleys and quill of your spindle, making sure that the saw table remains clean and rust free and more. Check out this article for all of the details. One of the more useful features of a drill press typically requires an attachment that will fit onto the drill press. That feature is using a drill press to cut square or rectangular mortises for a mortise and tenon joint. While a square hole can be created by drilling a hole and then squaring the hole with a bevel-edged chisel, with a mortising attachment, your drill press can do both with a single plunge of the bit. In this article, learn how to cut a mortise with a drill press.